Wow, A Cut Above The Retsy is one already, well, technically not until the end of the month, but who wants to wait to start celebrating? Since day one, the response to this site has been nothing short of amazing, so thank you to everyone for supporting me in my quest to get Etsy artists and artisans the exposure they deserve. As a token of my gratitude, I've put together a pack of Australian goodies to give away. Seventh tree soaps FB page! I found A Cut Above The Retsy through a Google search. Thank you so much for offering such a lovely and generous giveaway! I found you through someone sharing this giveaway on Facebook! I found you through a google search! A friend told me about you, but I follow you mostly on Facebook now. Heard about you via etsy australia (of all places... ;) ) on fb! Found you through Facebook. ....not sure how. ...but I don't mind....love to support fellow aussies! I heard about the giveaway through Papette Boutique's Instagram! What a wonderful site and such a generous giveaway of beautiful things. Thank you so much, Stacey! A friend just sent me your link. Thanks. heard about you through someone else's recommendation on twitter. I heard about you through Facebook! Awesome, thanks for participating Alexandra! Thanks for stopping by and participating! Well, thanks so much for following! I can't remember how I found you but have been following you on fb for ages. <3 etsy. I'm thinking it was facebook. Love the page. Oh how great, thanks for participating and good luck! 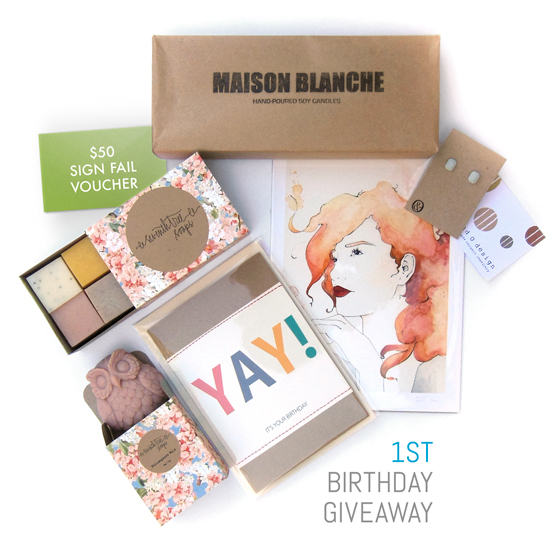 First heard about you guys and your first birthday through papetteboutique on instagram! A friend sent me a link. She knew I would love to know about A Cut Above Retsy. And I am!! From Seventh Tree Soaps on FB after finding them in my local paper. I heard about this page from my friend Lauren Kite who shared this competition on Facebook. Its about time there was some competent editing of ETSY! BRAVO! I think I found you via facebook! I found you through Colby June's facebook page. Check your blog every day now. I found you through a gorgeous and inspirational friend of mine who has a great eye for awesomeness! Can I be friends with her too? I linked to you via Facebook after you left a comment on a Design Files post earlier this week! Hi Emma, I'm so glad you decided to check out my site. Enjoy! heard about you on facebook! Found you on Facebook. Absolutely love your recommendations! Thank you so much, Georgina!